For Army head coach Earl “Red” Blaik, the 14-0 loss to Navy on November 30, 1957, had been especially bitter. The defeat had been the fourth in the last seven years for the Cadets at the hands of the Midshipmen, the worst stretch of his career. Blaik’s ’57 team had talent and heart, but little first-line depth, and the substitution rules of the day, which dictated that a player could enter a game only once a quarter, forced eleven Army starters to play an average of more than fifty-three minutes a game. “For four games we were all right,” said Blaik. “Then the pounding began to show.” The Cadets had finished 7-2, but everyone in the program felt sure that they could do better. Blaik’s solution to this problem was both wildly inventive and deceptively simple. To beat the eight- and nine-man fronts that were stifling the Army running game, he decided that he had to, in his words, “dislocate” them. Blaik did this by unbalancing his offensive line, taking a blocker from one side of center and moving him to the other. More importantly he split an end wide on the overloaded side of the line. To help the end conserve energy, Blaik kept him at a permanent remove from the huddle. He called this end his “far flanker.” History would remember him as the Lonely End. Blaik was not known as an offensive innovator. But what he sprung on college football in 1958 was unlike anything that had ever been seen before. Junior Bill Carpenter was the Cadets’ Lonely End, and the image of him standing silently aloof from his own huddle is one of the more hauntingly romantic images in the history of American sport. He stretched defenses, creating the space in which halfbacks Bob Anderson and Pete Dawkins ran wild from the first week of the season. Dawkins, Army’s senior captain, scored four touchdowns in the opening 45-8 victory over South Carolina. The Lonely End also opened up the passing game for junior quarterback Joe Caldwell, who threw two long touchdown passes in the 26-0 win over Penn State in Week Two—the first for fifty-five yards to Carpenter, the second for seventy-two to Dawkins. The next week, the Cadets traveled to South Bend, Indiana, and beat Notre Dame 14-2. Led by senior linebacker Bob Novogratz, who made eighteen tackles and recovered two fumbles against the Fighting Irish, the Army defense, proved it was as devastatingly effective as the offense. Blaik’s team was voted Number One in the Associated Press poll, a position it held for a second straight week after a 35-6 win over Virginia on October 18. 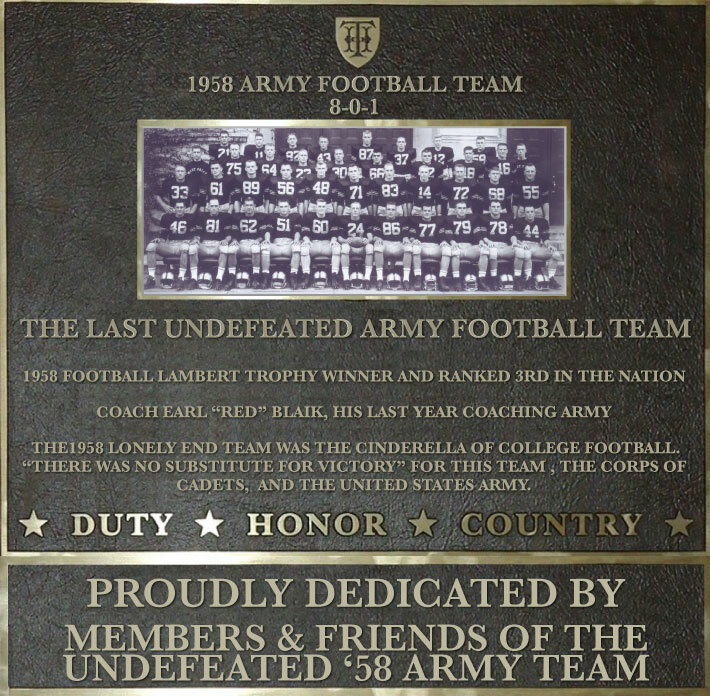 Injuries to Dawkins and rampaging fullback Harry Walters played a role in the only blemish on Army’s season—a 14-14 tie with Pittsburgh that cost the Cadets their Number-One ranking. But they responded by winning their next three games: whipping Colgate 68-6; prevailing over Rice 14-7 on a humid day in Houston; and trouncing Villanova 26-0. On Nov. 29, 1958, Blaik’s boys avenged their loss to Navy the year before, hammering the Midshipmen 22-6. Bob Anderson ran a game-high twenty-nine times for eighty-nine yards and two touchdowns. ​Blaik retired after the season, ending his storied career with one of the most glorious triumphs in Army history. The Cadets ranked first in the nation in passing offense, fourth in total offense, third in total defense, fourth in rushing defense and fourth in scoring defense. Anderson, Dawkins and Novogratz each earned All-America honors; Novogratz won the Knute Rockne Award as the country’s outstanding lineman; and Dawkins won both the Maxwell and Heisman trophies as college football’s best player.